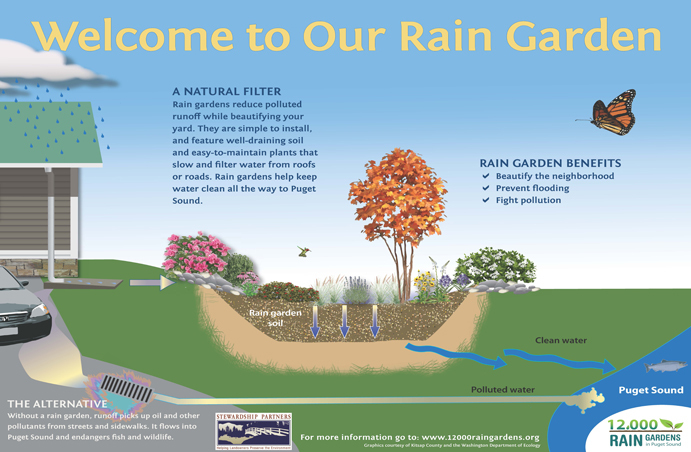 “What is a Rain Garden?” A rain garden is a bowl-shaped garden that, through the actions of spongy living soils and properly chosen plants, slows, filters, and absorbs runoff from roofs or pavement keeping it from becoming harmful storm water pollution. Rain gardens are a smart and proven way of using beautiful landscaping to: clean our waterways, protect our precious natural habitats, improve homes and neighborhoods, reduce flooding and save millions of dollars in pollution clean-up and massive utility construction projects. The majority of our region’s Puget Sound pollution is caused by rainwater runoff from our streets, driveways, lawns and rooftops! In fact, 14 million pounds of toxins enter Puget Sound each year. Having clean air and water and beautiful natural areas is a major part of what makes Washington a great place to live. Waterways like Puget Sound, Commencement Bay and the Skagit River give us places to enjoy nature, fish and hike. Our waterways are central to our food source, and our local economies. But toxic runoff, the number one source of pollution to Puget Sound, is threatening the health of our water. Every time it rains, millions of gallons of toxic runoff wash into Puget Sound and our lakes and rivers, spreading poisons that threaten our health, environment and economy. As our region grows, native forests are replaced with roads, parking lots and other hard surfaces. 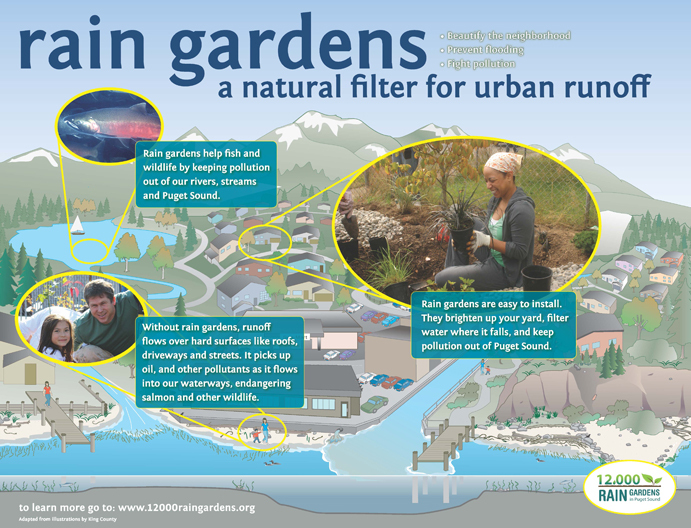 Rain gardens act like native forests by collecting and absorbing rainwater that washes over hard surfaces, filtering out pollutants like motor oil, pesticides and heavy metals.